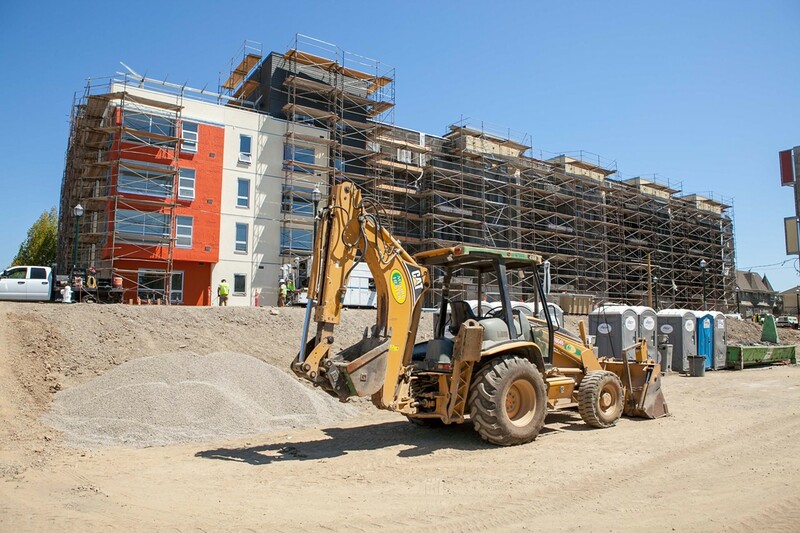 Bridge Housing's ninety-unit project near the MacArthur BART station in North Oakland was one of the only affordable housing projects constructed in the city this year — resulting in a highly competitive lottery. Mustafa Solomon doesn't want to leave Oakland. The 59-year-old photographer and activist has been a city resident for 35 years, but in recent months, he's become unsure if he'll be able to stay. After losing their longtime housing in North Oakland earlier this year, he and his daughter have been living in a temporary housing setup in East Oakland with someone he met through Causa Justa/Just Cause, the tenants' rights advocacy group. Solomon said they can't stay in their current place much longer, and that he's applying to move into any affordable housing he can find in Oakland. There aren't many options. "I just can't afford what the Bay Area is providing. 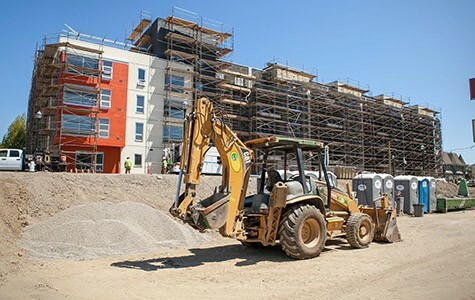 I'm out there everyday, but it's stressful," said Solomon, who is one of more than 5,000 people who recently applied for housing at a recently completed ninety-unit project near the MacArthur BART station — one of the only affordable housing projects constructed in Oakland in 2015. "I'm just waiting and hoping for something permanent." Solomon is one of many longtime residents feeling the pinch of the region's housing crunch, which reached crisis levels in the East Bay in 2015. The median home price in Alameda County is now $691,200, and the average rent for a one-bedroom is $2,891, according to the real estate firm Zillow. Those prices exceed the heights of the housing bubble in the 2000s — and many people's incomes have failed to keep pace. Relatively little new housing is being built, especially affordable housing, even though thousands of new residents are moving here. Meanwhile, local and state officials have been slow to address the crisis, and battles have erupted over high-profile projects across the region. Here's our look back at some of the major projects and policy disputes of the past year — and some debates and developments to look forward to in 2016. In Oakland in 2015, about thirty new housing developments were under construction with a total of roughly 1,300 units, according to data provided by Rachel Flynn, the city's planning and building director. Out of those new units — of which about half are finished or nearly complete, with the rest slated for completion in 2016 — about 430 (32 percent) are considered "affordable," meaning below market-rate. So while the city is experiencing a relative surge of new development — with many new projects in the pipeline for coming years — a supermajority of the units recently added to Oakland's housing stock are simply too expensive for low- and middle-income residents. "We've seen a real shift," Flynn said, noting that in previous years, Oakland built relatively minimal market-rate housing. In 2014, new developments added 715 housing units to the market — of which 82 percent were affordable. And in 2013, 93 percent of the 589 units constructed in Oakland were affordable. There were fewer total units built in 2012 — only 453 — and 82 percent of them were affordable. "If we don't build in general — whether it's market-rate or affordable — we're not going to keep up with demand," Flynn said. This year, however, few affordable projects took hold. Bridge Housing, a local developer that does affordable projects, completed the ninety-unit project by MacArthur BART called Mural (for which Solomon applied) and a 68-unit project at 460 Grand Avenue in Oakland, called AveVista. All those units are affordable. Additionally, the East Bay Asian Local Development Corporation began construction on a 71-unit project in Chinatown (1110 Jackson Street), slated for completion in 2016. Other than some senior housing and two smaller affordable projects — 18 units at 618 21st Street and 26 units at 1701 Martin Luther King Jr. Way — the rest of the 2015 housing developments were market-rate. Of those projects attracting higher-income residents, one of the most notable was the Hive, a mixed-use development along Broadway between 24th and 25th streets — a section of Uptown that is experiencing a significant amount of new economic activity. The Hive — a project of Signature Development Group, a major Oakland real estate company — will feature 115 units total when it is fully complete. Madison Park Financial Corporation, another prominent market-rate developer based in Oakland, is behind one of the other major projects under construction this year — a one hundred-unit building at 3900 Adeline Street in West Oakland. And developer CityVentures began construction this year on a fully market-rate project called Station House with 171 units at 1401 Wood Street in West Oakland. According to Flynn, Oakland is also on track to break ground on numerous large housing developments in 2016 and beyond. The biggest market-rate projects scheduled to start construction next year are: 435 units at 3093 Broadway (developers Blackstone Group and CityView); 200 units at 2302 Valdez Street (Wood Partners); and 162 units at 2935 Telegraph Avenue (Madison Park). Bridge Housing will also build 286 units as part of a second phase of its MacArthur BART project — but only roughly 6 percent of those will be affordable. In 2017 and onward, Oakland has major buildings scheduled for development across the city's neighborhoods — with more than 10,000 new units in the pipeline. The City of Berkeley, too, had a busy year for development — most notably with the approval this month of an 18-story, 302-unit project at 2211 Harold Way in downtown. Though the controversial project is entirely market-rate, the developer, HSR Berkeley Investments, has agreed to pay $10.5 million for affordable housing in the city. Developer Nautilus Group also moved forward with construction of a high-profile project, called Garden Village, on Dwight Way and Fulton Street near UC Berkeley. Ten percent of the building's 77 units will be affordable, and the project is unique in that it includes no on-site parking. That means it's a more environmentally friendly project that doesn't encourage driving and would be a good match for students and others who prefer to walk, bike, or take public transit.